How do I reserve an IP address for tleilax and ensure that tleilax only gets that reserved address? The tleilax box uses DHCP. How can I ensure that tleilax always gets assigned the same IP address? The tleilax box uses DHCP, but the router—a Netgear Wireless-N 150 Router WNR1000v2—should always give it the same IP address. It also happens that tleilax, has the FQDN of tleilax.bounceme.net and so that domain should be registered in the router as well so that anyone on the LAN (me) can navigate to http://tleilax.bounceme.net/ and the router will direct to tleilax accordingly. I prefer to do this configuration on the router, so that tleilax can use DHCP, but don't quite know where to start with the router. How can I ensure that tleilax always gets assigned the same IP address? When you specify a reserved IP address for a computer on the LAN, that computer always receives the same IP address each time it accesses the router’s DHCP server. Reserved IP addresses should be assigned to computers or servers that require permanent IP settings. Enter the MAC address of the computer or server. If the computer is already present on your network, you can copy its MAC address from the Attached Devices screen and paste it here. Click Apply to enter the reserved address into the table. The reserved address is not assigned until the next time the computer contacts the router’s DHCP server. Reboot the computer or access its IP configuration and force a DHCP release and renew. Not the answer you're looking for? 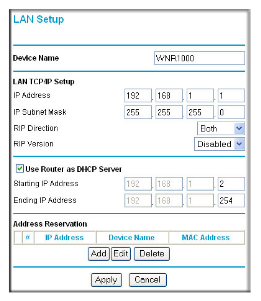 Browse other questions tagged networking router ip dhcp webserver or ask your own question. How do I assign a static IP address to an ICS client? How to access a Router that has DHCP turned off and IP address unknown?